A Canadian Christmas classic here, "Christmas with Don Messer and his Islanders". Unlike Don's usual Apex LPs, this one features plenty of Marg Osburne and Charlie Chamberlain along with the jigs and reels. The album was released in 1960, the same year "Don Messer's Jubilee" became a prime-time CBC-TV feature. Broadcast nationally, it went on to become one of the most successful Canadian television shows of all time. More country Christmas goodness, this time from Hank Thompson and His Brazos Valley Boys. Thompson had one of the best bands in the business, and they shine on these seasonal favourites. Although these mp3s are sourced from re-issue CDs, I have included scans of the original jacket. A great album on Swallow Records from 1978. Christmas in Acadiana is not characterized by carollers in the snow or even by extremely cold temperatures. Often a balmy weather prevails over Christmas. Sometimes, if we're experiencing an early winter, we will have cold, icy weather, and the trees, the ground, and the rooftops will be coated with a white frosting, giving us an illusion as to what a white Christmas could possibly look like. Despite the weather, Christmas in the Cajun country of Louisiana is always a holy time, a special great time of year for all. Of course when Santa arrives in the Cajun country, due to the usual lack of snow, he has to switch from the traditional sleigh pulled by reindeer, to the "traneaux" (a Cajun dirt and mud sled) pulled by a special team of eight alligators. And Santa gets a sparkle in his eye and a special warmth in his heart as he travels Acadiana hearing songs sung in French and played by noted Cajun musicians! I picked up this cassette on the "Holiday" label at a local thrift shop for 25¢. It turned out to be a reissue of the 1962 Apollo LP! 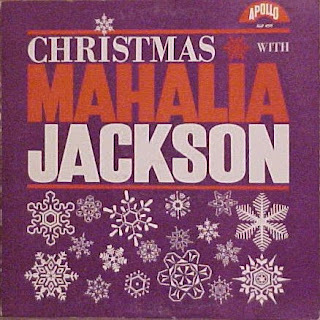 Mahalia recorded 1947-1954 for Apollo before going on to achieve international notoriety on Columbia, and Apollo seemingly issued an LP of older material to capitalize on this success. These are not all specifically Christmas songs, but they are all great performances. The remastering here is crude, as it is on many collections of her Apollo recordings. I imagine when this was put together in '62 they just dropped the needle on some old 78's, but it's still a great find, the original LP must be a scarce item by now. I Hope this post makes some of you out in blogland tingle. Homer & Jethro's 1968 Christmas LP is featured courtesy of our pal Andyrama who allowed me access to the album to transfer for this blog. As usual, we have goofy lyrics combined with the best musicianship Nashville had to offer. Please note the Santa'd-up Chet Atkins on the mantle! Settle back with some peanut brutal and enjoy Homer & Jethro's "Cool Crazy Christmas"! 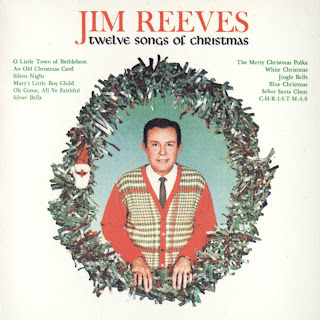 Another classic country Christmas album on RCA Victor, "Twelve Songs Of Christmas" by the late Jim Reeves. It was recorded Oct 19th to 25th, 1962, at the RCA Victor Studio in Nashville and released in November of '63. Jim, of course, passed away in 1964 in an airplane accident. I'm sure this was a yearly favourite in many households, so if you haven't heard it in a few years, enjoy! Here is Hank Snow's 1967 Christmas LP. 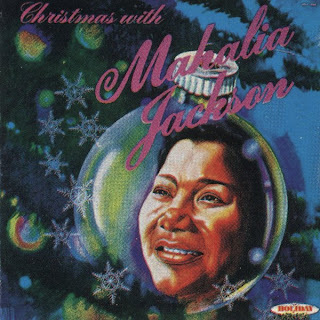 The complete album is included, as well as "A Letter To Santa Claus" and "Nestor, The Long Eared Christmas Donkey" which were issued in the 1970's as singles. These versions were drawn from CD, but I included scans of the original LP jacket. It's Snow for Christmas! More country Christmas here with 1962's "Christmas Day with Kitty Wells". Pretty standard fare, "Christmas Ain't Like Christmas Anymore" being the standout track for me. If you can't get enough of Kitty, I also included "The Kitty Wells Family Gospel Sing" from 1965. It features not only Ms. Wells, but also her husband Johnny Wright (sounding good post Johnny & Jack) and their children Bobby, Ruby and Sue Wright, all of whom pursued music careers at some point. From 1961 comes this Chet Atkins produced, pop-country Christmas LP. I don't have much time for these types of albums through the year, but this one contains one of my favourite seasonal country tunes, "Will Santy Come To Shanty Town?". R.I.P. 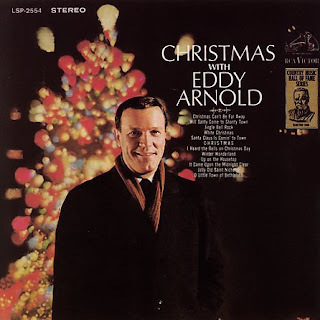 Eddy Arnold, who passed away in May of this year at age 89. For the next little bit it will be all Christmas music at the Scratchy Attic. 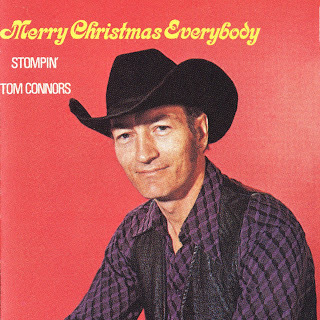 Since we started back in November with Wilf Carter, I figured the next logical place to go was with his protege, Stompin' Tom Connors. The first incarnation of this album appeared on the Dominion label in 1970. Tom had recorded a few albums on the Rebel and Dominion labels before he and producer Jury Krytiuk started Boot records in 1971. These albums were released on the new Boot label, but in some cases the original masters were not available so they simply had Tom re-record the entire albums! Well folks, I'm back. I apologize for the delay between posting here, but I had some computer troubles that hung me up for over a week. Torn hair and a windows re-install later, here I am, back in blogscape. Here we have an oop bootleg cd that actually belongs to my friend Chris of the Mayville Brothers (he's got my Moon Mullican, we've been meaning to trade back for a few years now...). Chris and his brother J. P. have a fine band out of the Windsor, Ontario area called the Silvertones. Click here for more about the Silvertones! When not onstage, the boys run an excellent music store in Tecumseh, Ontario, called, appropriately enough, the "Tecumseh Music Centre". Click here for more about the Tecumseh Music Centre! Back in the day, these boys, along with Gary Smyth, now of Kelowna, BC, were the most faithful of jammers at my regular Tuesday night shindig at Windsor's Bridge Tavern. A regular highlight of the evening was always their cover of Pee Wee's "Catty Town", the first track on this album. 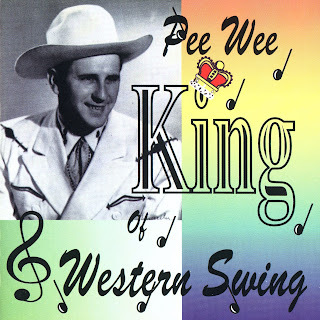 The great Pee Wee King and his famous vocalist Redd Stewart (who was to Pee Wee what Tommy Duncan was to Bob Wills) were huge stars of the 1940's and into the early '50's. 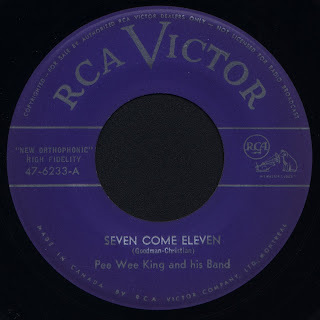 With a story that beautifully contradicts the stereotypical country music biography, Pee Wee King was a Polish polka musician from Wisconsin who became a leading Western Swing bandleader in the not so Western (or at the time, swinging) city of Nashville. His band launched the careers of folks like Eddy Arnold and Cowboy Copas, and he and Stewart wrote and first recorded the Tennessee state song, "Tennessee Waltz". The first 30 tracks are from the cd, and as a bonus I have added three tracks from some vintage 1950's 45rpm singles in my collection. These are the great instrumentals "Seven Come Eleven", "Farewell Blues" and the vocal track "You Won't Need My Love Any More". The cd seems to eschew waltzes, but these were a huge part of the Golden West Cowboy's repetoire, so I have also included "The Nashville Waltz" from an old RCA Camden LP. 22. Going Back To A.L.A.